hehe np. I was just giving you heck for having a clever idea before Noon. Everyone knows clever ideas are supposed to be saved for around 3:45 Friday afternoon! 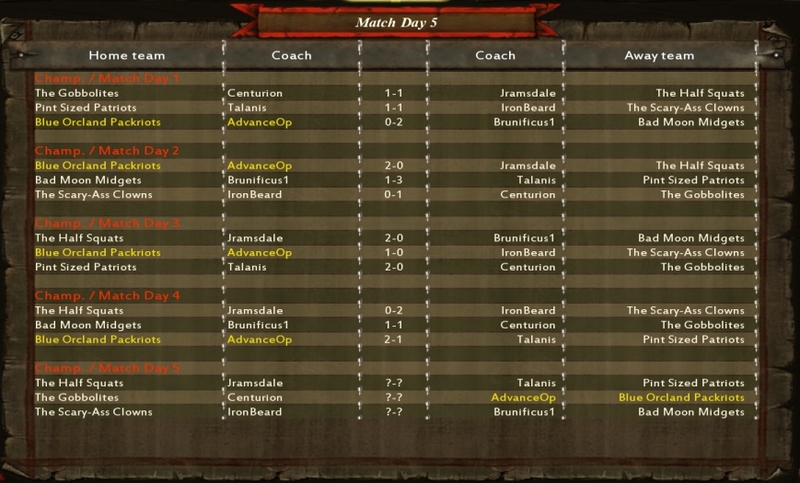 Well Bad Moon Midgets beat the Blue Orcland Packriots 2-0 tonight. To play you go to "play" pick your team and hit play match (with me so far?) your opponent needs to keep an eye out for a not so obvious pop-up as far away as possible from the chat window in the bottom RH corner. I still need to approve matches just like BRAWL, so be patient, I won't be able to update those results anywhere near as quickly as BRAWL. Until I approve the match you wont be able to update your roster. Have fun! I'm still laughing at Goblin incompetance. My first and only skill up from the match was a +1 agi on a gobbo BRILLIANT! yes, quite hilarious game. Failed fanatic, failed chainsaw. trolls constantly on the ground or suffering from really stupid. Not too mention the failed pick up on turn 16 in the end zone to win the game. Spoke with Talanis last night and his match is scheduled for Thursday. However, pending how much of an oppertunity I have for Manual intervention this week, all future games will be kicked over on a Wednesday night - no questions asked - if the system hasn't already done it. Its penciled in for Friday actually but well see if it gets squashed or not time will tell. do you know who is playing who for next round? If you go to "Leagues" then select "Calender" you should be able to see all the matches. I say "should" because I can see them, and have to hit yet another button to "Manage the League" but given all the other non-intuitiveness of the interface I wouldn't be surprised if you can't see all the match-up's. One all draw between Talanis and me (managed to play tonight). Talanis gets one up in the first half, and then I kick to him. I manage to sack his ball carrier one square from HIS OWN end zone. The ball goes out of bounds (as I knew it would) and the crowd kicks it in. ... TO THE MIDDLE OF MY HALF OF THE PITCH!!! Good and bad luck abounded, and the game took about an hour to play (second half longer than the first), but it was awesome fun. That Fan's got Talent! Hire him as a kicker!! Match results approved and the season kicked on a day! Rock on! Halflings got smashed tonight 2-0 to the Blue Orcland Packriots. Fortunately for The Half Squats not too much lasting damage. Here's the season match-up's & results to date.